This script is used to quickly and easily put a stop to 404 errors. I created this script to make sure I wasn’t losing customers, orders, etc. 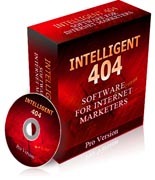 This Intelligent 404 is easy to configure and install. Simply edit one file and upload four files to your web server.